When I signed the publishing contract for A Pleasing Aroma, I promised God, my family, and myself that I would not incur any debt related to the book. Keeping that promise has required that I step way out of my comfort zone, relying strictly on God's provision rather than on my own resourcefulness. Getting through production and kicking off sales have proved to be more challenging than I ever imagined, but God has been faithful. 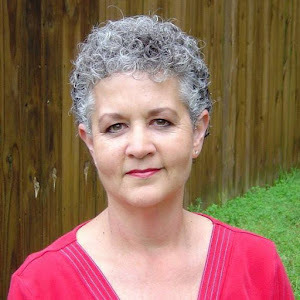 Although I am passionate about the message He has given me to share, I have learned that whatever God accomplishes through my writings will be done in His way and according to His timetable. Although I sometimes feel overwhelmed by the pressure to schedule events to market and sell my books, God has shown me time and time again that He has other priorities for me in this season of life and that all my efforts are nothing compared to His provision and blessing. Each of us has a calling, a dream, or a passion that God has placed in our hearts. Are we willing, though, to surrender that calling to His Lordship and trust Him to fulfill our purpose as He sees fit? If we will try less to make things happen and trust God to accomplish what we can not apart from Him, we will find joy in the journey and discover a level of intimacy with Him that we have never known before. The next time you feel frustrated with the progress you are making, instead of trying harder just try trusting! Come live in my heart today." 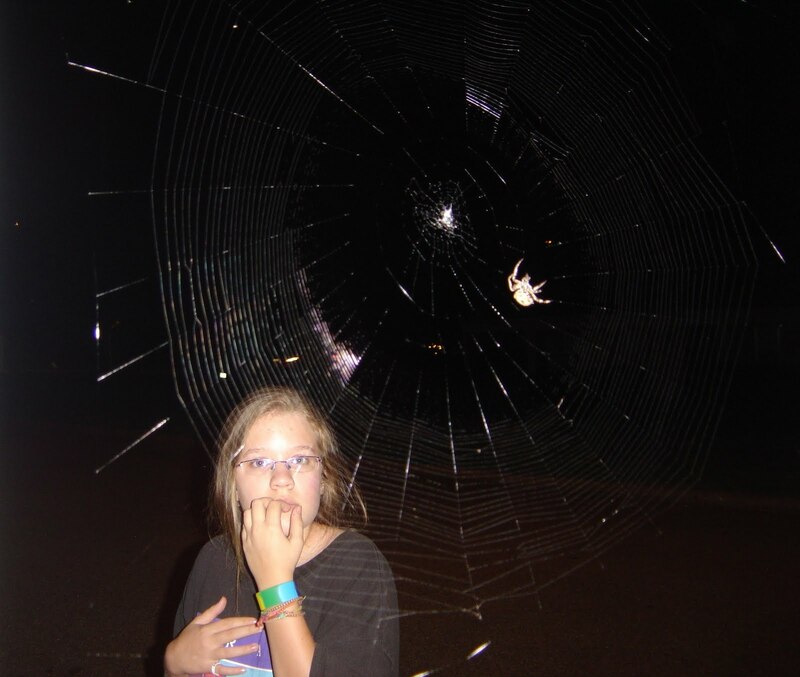 Meet Sam (or Samantha, if he's actually a female spider). Sam is one BIG spider and has been spinning a web nightly between the street light and the speed limit sign on the curb between our house and the next door neighbor's. 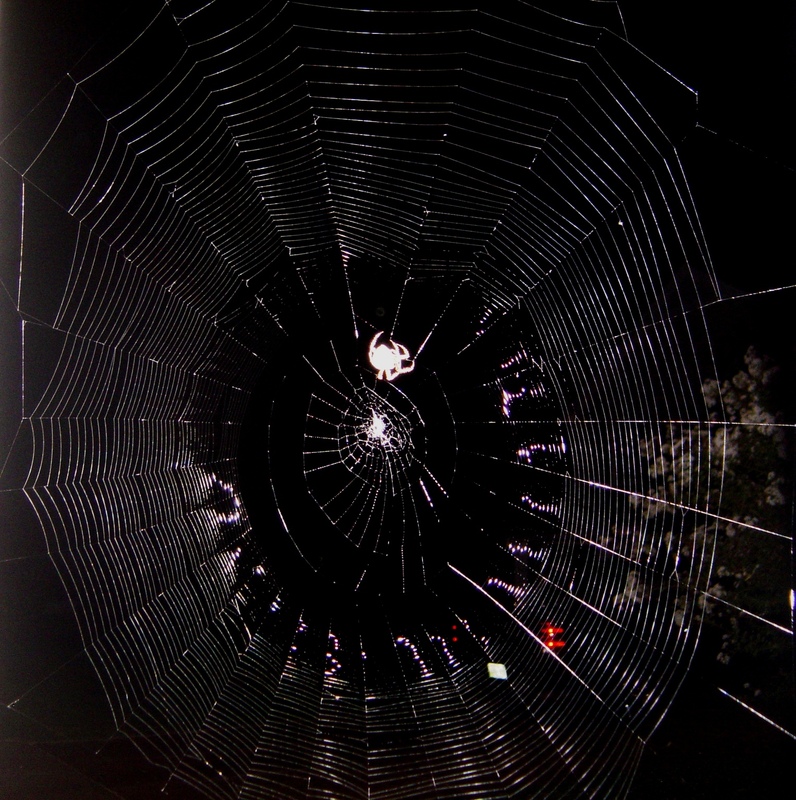 Sam comes out at dark and in less than two hours constructs a web at least two feet in diameter. 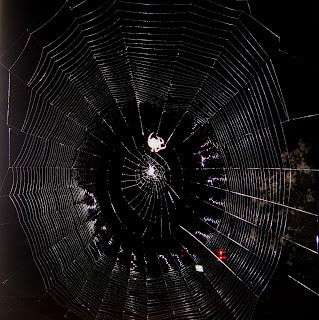 By 6am the web will be completely gone and Sam will start building a new web when night falls again. The picture of Joy and Sam below will give you a little perspective on how large Sam really is. With legs extended, Sam is easily the size of a half dollar, with his abdomen about the size of a dime. Tonight I watched Sam go after the moths that found their way into his web. The instant he sensed their presence, he snatched them up, wrapped them in silk, and reattached them to his web for a late dinner. The poor moths were no match for this skilled hunter. Watching Sam this week has left me in awe once more over God's creative genius and the wonders of his creation. Truly we are not the only ones fearfully and wonderfully made. Sam is a pretty cool arachnid and certainly no itsy bitsy spider.